Alla Volobuyeva was born on April, 2 in Kyiv. In 2002 she graduated from T. Shevchenko Republican Art School. From 2003 to 2009 she studied at the National Academy of Fine Arts and Architecture at Huida studio (teachers – M. Huyda, O. Yasenyev). 2016 – Wind of Tibet. ART 14 gallery. Kyiv, Ukraine. 2015 – the personal exhibition at the Museum of Spiritual Treasures of Ukraine “Convergence”, Kyiv, Ukraine. 2013 – The Institute of Contemporary Art Issues, “Chemical and Eden”, Kyiv, Ukraine. 2013 – The Museum of Spiritual Treasures of Ukraine, “The Exhibition of Young Artists of Ukraine”, Kyiv, Ukraine. 2013 – «Neu Gallery», Kyiv, Ukraine. 2013 – The Kyiv Fortress Museum project “Magma”, Kyiv, Ukraine. 2013 – Slava Frolova’s Art-Piknik, Kyiv, Ukraine. 2012 – International Chinese-Ukrainian project “100 Years of Art of Ukraine”, Beijing, China. 2012 – Solo Exhibition at «GreenWave» Gallery, Usi, China. 2011 – The Institute of Contemporary Art Issues, “Collective dreams”, Kyiv, Ukraine. 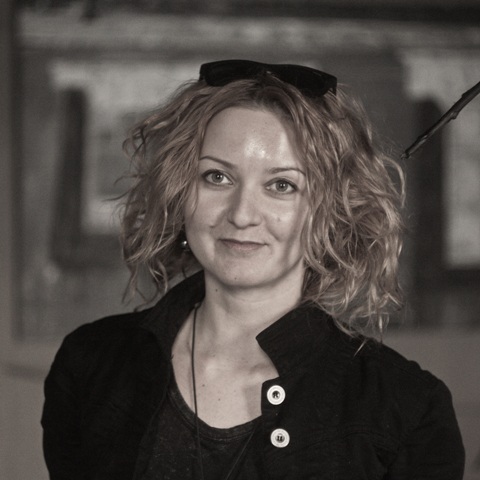 2011 – “Art Bar” Gallery, Vinnitsa, Ukraine. 2010 – the personal exhibition «9 months in China», «Green Wave» Gallery, Usi, China. 2010 – The Exhibition Hall (Sponsored by the Ukrainian Embassy in China), Beijing, China. 2010 – The Embassy of Ukraine in China. Exhibition of art works of artists and Kiev Seminar, Beijing, China. 2009 – “SoviArt” Gallery (with the support of the Embassy of Israel), Kyiv, Ukraine. 2009 – the personal exhibition “Oriental sketches,” “Triptych” Gallery , Kyiv, Ukraine. 2008 – “Triptych” Gallery, “The Portrait of the Artist”, Kyiv, Ukraine. 2008 – “SoviArt” Gallery (supported by the Embassy of Spain), Kyiv, Ukraine. 2007 – All-Ukrainian Triennial of Painting “Kyiv-2007″, Kyiv, Ukraine. 2007 – the personal exhibition “Indian Summer”, “Griffin” Gallery, Kyiv, Ukraine. 2007 – “Living as a dream”, “SoviArt” Gallery, (supported by the Embassy of Spain), Kyiv, Ukraine. 2006 – the First prize in the competition of animation, Florence, Italy.